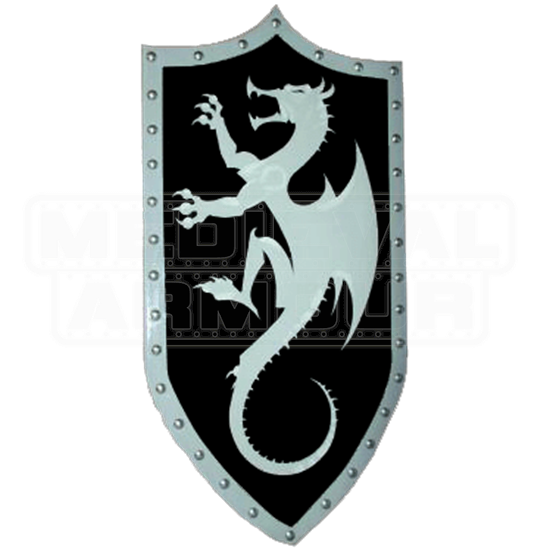 The Wooden Silver Dragon Shield is a tall Gothic shield shape featuring a stylized winged dragon over a solid black background. The silver dragon shield is actually painted with a grey base and has added white highlights and accents. It is very unique. This beautiful shield is made of composite wood, which is considerably stronger and more durable than plywood. 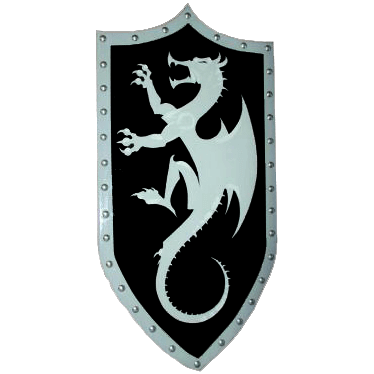 The Wooden Silver Dragon Shield measures about 40 inches in height. Stainless steel studs line the border, and dual leather straps are used to comfortably secure the arm along back. The Wooden Silver Dragon Shield has several coats of high gloss finish have also been applied to protect the design from wear. The Wooden Silver Dragon Shield would be perfect for upcoming Renaissance fairs, theatrical productions, or medieval reenactments.